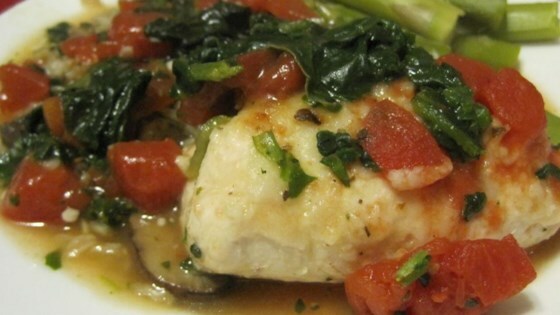 "This is a favorite chicken recipe, my son requests it every year for his birthday." In large skillet, heat oil over medium heat. Cook chicken breasts for 1 to 2 minutes on each side, until golden. In a small bowl, whisk together 1 1/2 cups water, chicken bouillon cube, and remaining flour; pour over chicken breasts in pan. Add spinach and tomato to skillet, and bring to boil. Cover, reduce heat to low, and simmer for 8 to 10 minutes, or until chicken is no longer pink inside. Discard toothpicks before serving.